Leeds United fans show their support against Derby County. 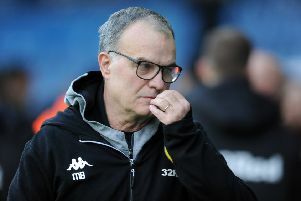 Whether or not he has had his “spies” watching Stoke City it looks like Marcelo Bielsa will be taking a rejuvenated Leeds United team with him to the bet365 Stadium on Saturday. 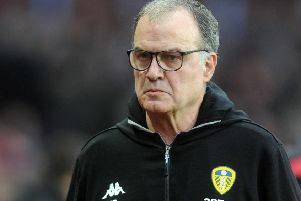 After defeats in their previous two Sky Bet Championship matches the Whites came out fighting against promotion rivals Derby County and produced one of their best all-round displays under Bielsa. The 2-0 winning margin could have been much bigger and it sent a real warning out to the rest of the division that United were not for collapsing just yet. All the attention that the so-called “spygate” affair generated somewhat overshadowed the outstanding performance on the night and not for the first time in the club’s history they were not given the credit they had deserved. But the furore over sending a scout to try to get a peek at what Derby County were doing in training ahead of last Friday’s game has managed one thing it would appear – to galvanise an us against them feeling that has managed to make Leeds united again. Where there were a few cracks beginning to appear off the back of three straight defeats suddenly it was a Leeds team really fired up for the big clash with Derby. They were roared on by a crowd who made the atmosphere resemble those memorable Champions League evenings and the players responded to the electric feel in the air whereas a Derby team full of good young footballers seemed to crumble. More of the same for the rest of the season and Leeds will be celebrating promotion. Norwich will not need to spy on any training ground tactics to work out what they can expect when they are the next away team to come to Elland Road and they will need strong players who can cope in what is sure to be another white hot atmosphere. But it is away days on the agenda before that big February date with United on their travels on the next two weekends, first to Stoke. They will once again be without the suspended Kalvin Phillips, who sits out the last game in his three-match ban, but could have new players in the squad to flesh out their squad which has looked threadbare in recent weeks. The substitutes’ bench against Derby was completely made up of under 23s players with a combined average age under 20. But attacking midfielder Izzy Brown may take his place on the bench this week after signalling his return to fitness with two goals in Monday’s under 23s’ win over Crewe and Leeds are believed to be closing in on at least one signing. Goalkeeper Kiko Casilla is expected to arrive from Real Madrid while winger Daniel James appears to be heading a list of wanted names in outfield positions as a replacement for the departed Samuel Saiz is sought. Casilla is believed to be flying in from Madrid for a medical this week. United are prepared to take on the rest of his deal at the Bernabeu, which runs until 2020, and have set up a move which will involve no transfer fee for the 32-year-old. They are hoping to get the deal over the line before the Stoke game.